Actors Greg Porretta and Kimberly Wilson did a historic dialogue based on letters of Thomas Dew and Sojourner Truth at the Westport History Society's "Saugatuck Social" on Thursday, March 28, 2019, in Westport, Conn.
With women’s suffrage as the general theme, visitors to the free event were privy to readings, songs and background history, as well as informal discussion. Popular in the Victorian era, she said, “They were a great way for individuals to share essays, pieces of literature and poems,” and well as their ideas about a particular topic. 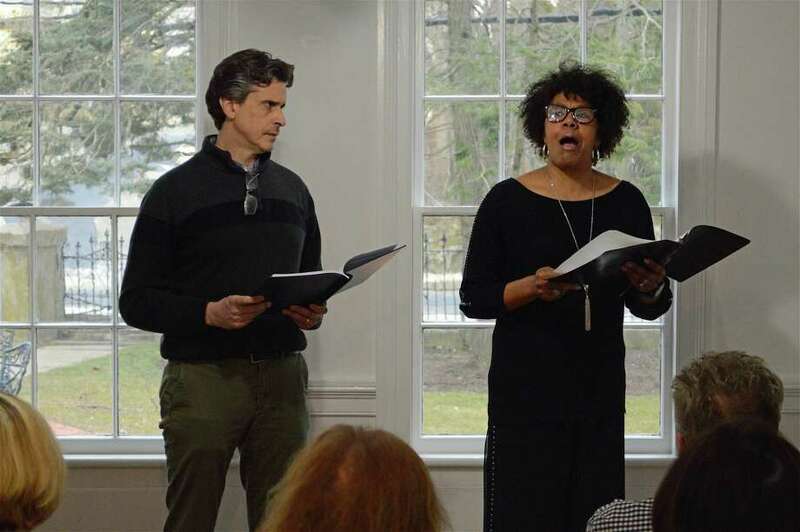 Westport actors Kimberly Wilson and Greg Porretta performed a dialogue based on the writings of Sojourner Truth and Thomas Dew, crafted by Executive Director Ramin Ganeshram. There was also singing of suffragist songs, led by Kate Mozier-Tichy, museum associate. The society will host its next one on June 6 with the theme relating to the anniversary of D-Day. Individuals are invited to contact the society about presenting their own original material at the next event.